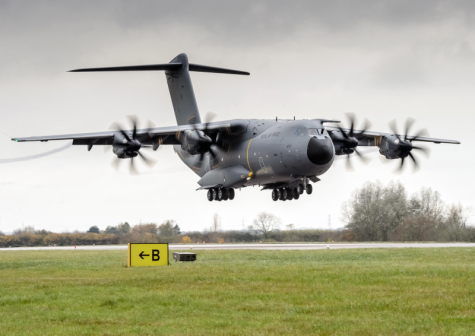 PARIS --- Recently discovered problems with the A400M’s engine look more serious than initially claimed, with Airbus Group CEO Tom Enders now saying they were a “serious challenge,” and finance director Harald Wilhelm adding that their financial impact “could be significant." The comments -- made April 28 as the company released its first quarter results, which saw net income drop 50%, to €399 million, -- seem to have spooked investors, as Airbus shares fell 6% after the April 28 announcement and did not recover Friday. While delays in deliveries of the A320neo airliner (because of late delivery of its Pratt & Whitney engines), and of the latest A350 airliner (faulty components delivered by suppliers,) may have also contributed to shareholder nervousness, it is the A400M that appears to hold most financial risk for investors. In less than one month, Airbus has completely reversed its position on the issue, going from saying it “has no impact on the security of the plane” and “can be solved during regular engine inspections" when the news first broke in late March, to the ominous warnings by its top executives. Including one for €290 million in 2015, Airbus has already taken charges of more than €4 billion for delivery delays on the A400M, while in 2010 the partner nations also provided a €3.5 billion bailout, so investors have reason to be wary. Now, Airbus has publicly acknowledged for the first time that its plan to deliver 20 A400Ms to customers this year may be compromised. “On the military side, we are now facing a serious challenge for production and customer deliveries of the A400M due to new, unexpected issues on the engine propeller gearbox. It’s very frustrating but we’ll have to work through this with our engine partners,” Enders said in the April 28 statement. In 2015, Airbus delivered only 11 of the 16 aircraft it had promised to its customers, and so far has only delivered three this year – all of them to the UK’s Royal Air Force – so it has eight months left this year to deliver the remaining 17 – half as many again as it was able to deliver in 2015. The latest engine problems were discovered in March, when an engine of a Royal Air Force aircraft failed in flight, leading to an investigation by European airworthiness authorities which have since issued a directive specifying a special inspection régime until a fix is certified. The problem has been tracked to a propeller gear box (PGB), in which a part can crack and release metal particles into the lubrication system, where they are detected and cause the engine to shut down. This latest problem will further complicate negotiations with the A400M partner countries to agree a new delivery schedule, which has been under negotiation for over a year and which were disrupted last year by the May 9 crash of an A400M being prepared for delivery to Turkey. The discussions also cover the “mission capability roadmap,” a plan detailing how Airbus will deliver the operational capabilities that were temporarily ignored to allow deliveries to begin.